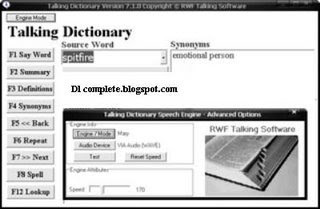 Talking Dictionary is a completely speech enabled software product that does not require a screen reader or any additional software for normal operation. The dictionary can be activated from the start menu or via the desktop shortcut. The dictionary will automatically speak out the first definition. To hear the synonymous words, press the F4 key. When pressed once, the F1 key is used to speak the word being looked up. The F2 key can be used to find out how many definitions and synonymous words were found. During normal usage the dictionary provides wordy assistance. This is known as verbose mode. When Control Echo is activated the dictionary will speak each key as it is pressed.